This is a bit of a long story, but I hope it will be of interest to you. About 40 years ago a group of us—at the time, we were Florida high-school classmates—formed the Palm Beach Naval Wargames Club (PBNWC). We played mostly with Superior 1/1200 models purchased through Alnavco, and used Fletcher Pratt or Seapower rules. At least one of our wargame reports was published in the Alnavco Log sometime in the early 1970s. At one point the PBNWC had around a dozen members, and we managed to hold naval wargames relatively frequently for a few years. The games were played on garage floors, patios, living room carpets and even in a church fellowship hall a couple of times. Many of them were multi-day affairs. We were dedicated to the pastime; two of us even traveled to England one summer and managed to visit with Donald Featherstone while we were there. After graduation from high school we became busy with college, careers and families, lost touch and stopped gaming. One of us joined the Army in 1973 and was wounded during the evacuation of Saigon (he recovered). The rest of us remained civilians and scattered all over the country--one moved to Hawaii, while others eventually relocated to Michigan, Texas, Georgia, Illinois and California. (Eventually two of us moved back to Florida.) We currently work in fields as varied as writing and editing, accounting, logistics, security, information technology and law. One of us is an IRS agent (a useful guy to know). We’re now in our mid-50s, some with children of college age and older, although one member who married much later in life has a very young family. In short, we’re probably a pretty typical cross-section of middle-age, middle-class America . Over the years I managed to acquire the group’s old 1/1200 and 1/1250 model ships, and now the collection has grown to over 400 vessels. I also kept our old Fletcher Pratt ship-cards, firing arrows, knot counters and golf tees, along with an equally-ancient set of Seapower rules. My older daughter, who is now in college, became fascinated by the hobby and urged me to organize a game. I had stayed in contact with one other member of the PBNWC over the years, and a little over a year ago we tracked down five of the others. We decided to hold a wargaming reunion this spring, here in Florida. I worked up a scenario and made up a lot of new ship-cards—fortunately there’s a UK wargaming website that offers a user-friendly online ship-card generator, which made the job much easier. The recession cut into attendance a bit (one of our group works for an auto-parts supplier to GM, and is wisely watching his pennies). But we still managed to get a group together for a Fletcher Pratt-rules game, set in a world in which World War II had unfolded a bit differently. For two days we moved miniatures around my garage floor, abusing our now much-older knees. The result was a draw—we simply ran out of time to fight it to a conclusion—but a good time was had by all. Attached is a report of the game, along with the alternate historical scenario underlying it. (I had as much fun with the alternate history—inspired in part by the works of author Harry Turtledove—as I did with the game itself.) The game itself is set in circumstances similar to those off Guadalcanal in the real-world version of history. At any rate, thanks for taking the time to read this, and I hope you find the attachments enjoyable. If you think others may be interested, feel free to publish or otherwise share them (or any part of them) if you so desire. P.S.—I’ve attached three photos from the game. 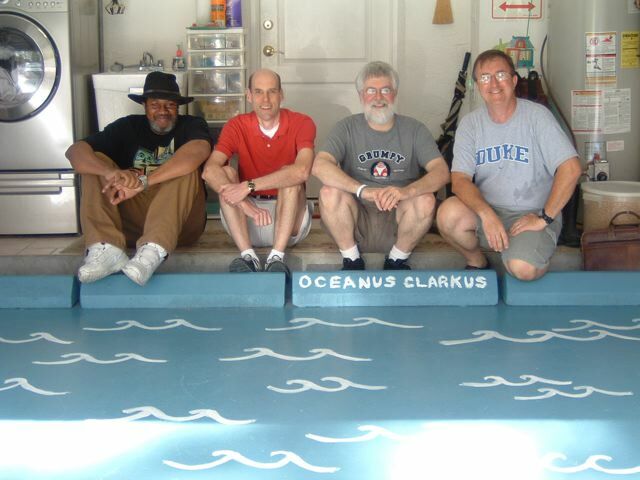 Left to right in the first photo are PBNWC-ers Karlon Cunningham, Reid Chamberlain, Rob Stone and me. 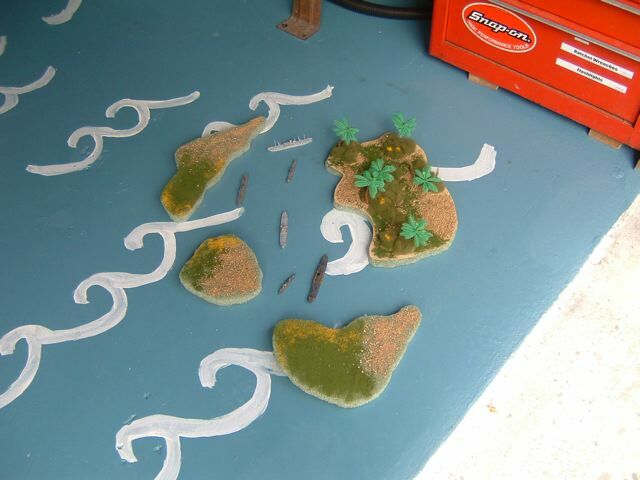 The “waves”, “Oceanus Clarkus” sign and “islands” enclosing the anchorage were my wife Sally’s contribution.